Determined to bring her would-be killer to justice, Kirby joins the Chicago Sun-Times to work with the ex-homicide reporter, Dan Velasquez, who covered her case. Soon Kirby finds herself closing in on the impossible truth. I’ve put off reading and reviewing The Shining Girls for a ridiculous amount of time. It’s not because I didn’t want to review the book, but because books that are so incredibly hyped up tend to put me off. Everyone else is reviewing them, what could I possibly say that hasn’t already been said? Then, Mulholland Books sent me a surprise copy of the new paperback version of the book in the mail and my excitement overwhelmed me. I read it and now I am reviewing it. Lucky you. The thing is, I like psychological books. I enjoy books where the antagonist is a real piece of crap that really manages to get in my head and keep me up at night. The Shining Girls has that in spades. On the other hand, I hate time travel. I never can mentally get my head to a place where time travel makes any reasonable amount of sense to me. It’s no different in The Shining Girls. However, Beukes makes up for my problem with the logical leap by the fact that her antagonist is basically batshit insane and so self-involved and weirdly tunnel-vision-motivated through most of the book that the logic problems I always face with time travel never really come into play here. The reason the time travel works so well isn’t just because of the weird antagonist, but also largely due to Beukes fantastic use of narrative. She does a great job at establishing a very real world with enough arbitrary, but real aspects that the times easily blend together. It makes it easy for the reader to believe that Harper just opens the door one day and walks from the 1930’s into the 1970’s (or whenever else). There’s enough cultural blending and fuzzy edges to make each time and place seem real, but somewhat universal at the same time. The reason this is important is because, without my need to focus on pesky time travel, I could spend a lot more time focusing on the plot and characters and the various side plots that are going on. The truth is, The Shining Girls is almost doggedly focused on its overarching plot, which is a good thing when you think about all the time travel and world building aspects thrown in. Too much packed into this book would have made it very, very messy. Instead, Beukes wisely decided to focus on the main plot, the characters and the world, with some small side plots thrown in here and there for good measure. It keeps this (fantastically) messy book incredibly neat and easy to read. Harper is a fascinating character that you can’t really help but love despite yourself. He’s one of those characters that I love so much because he is so intensely real and creepy. I wanted to take a shower after I read passages with him in it. I know that sounds weird, but that is actually a testament to how incredibly real this book and these characters are. It’s very rare that I read a book with characters or situations that are so real I want to hose myself down afterward. Harper does that for me. In contrast, Kirby was also very real, but she felt very broken, and very lost for much of the book. While she was just as well realized, her personality felt more fluid, and harder to pin down than Harper’s. It took me a longer time to warm up to her story, and find it as fascinating as Harper’s, than I expected. Thinking back on the book, I think one of the most interesting aspects of it is just how well Beukes managed to weave together the story into one powerful, climactic, very unexpected ending. The Shining Girls isn’t what I expected at all, and that’s the real strength of it. 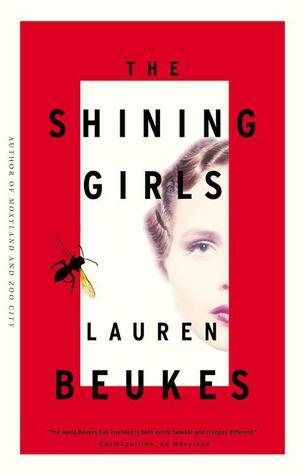 Nothing is what it seems to be, and Beukes masterfully plays her audience, slowly revealing what is going on as the book progresses, and really managing to get into our minds. It is incredible, it really is. However, despite the complexities, and the layers (and there are a lot of both), Beukes never really loses her way. She never gets mired in the details or bogged down by events, or her very (very) powerful characters. She stays true to her course, and because of that, this book is such a fast read, because you’re pulled so far into it that you can’t really surface until it’s over. It’s so incredibly rare when that happens – when an author can tell such a complex, powerful, twisted story and manage to keep her readers moving effortlessly through the whole thing, all the while managing to tie things up so neatly. I’d love…. LOVE…. to spend an afternoon with the woman that can write a book like that. I often complain about the fact that I absolutely love Stephen King, but I get really annoyed with how wordy he is. Why say something in ten words when you can say it in 2,000? There is a time and place for that, and sometimes that’s really what I want, but most of the time I want books like The Shining Girls, where each word is cunningly used to lead the readers along on this confusion, very psychological path. The atmosphere is amazing. The world is very well done. The time travel actually didn’t annoy me for once. Harper is probably one of my favorite creepy characters I’ve ever read. This book got right into my head, and I read it so fast it was ridiculous. This shows Beukes at her finest. This is skill. This is talent. This is how psychological/horror/mystery/time travel books are supposed to be written. Stephen King-esque, but better. So much better. If King is the Maximum Overdrive of using lots of words,, Beukes is the shining knife. Yay!! This was one of my Best of 2013, so glad you liked it!! Normally I don’t go for time travel books, or even contemporary fantasy. But I DO like psychological thrillers, and books with interesting characters. Hmmm… I just realized that the reason I want to read it is because you said the antagonist is so creepy he made you want to take a shower afterwards. Is that weird? Give this one a try, you’ll probably love it. And as for Harper, he is a creepy dude, and that is a WONDERFUL reason to read a book. Any author that can manage to infuse their character with enough realism to make me want to shower after reading is an author well worth my time. This book would be on my Hugo shortlist. Buekes is automatic for me in terms of authors whose books I’ll read.